Pendarvis Manufacturing's home in Southern California makes it an ideal firm to manage any of our customers' stainless steel fabrication needs. With modern in-house CNC machining capabilities, six welding stations, and hundreds of combined years of experience taking designs and creating custom precision parts and massive engineered structures, Pendarvis Manufacturing is able to miter cut, weld, assemble, and finish any stainless steel fabrication project to precise standards for a wide variety of industries. Stainless steel is particularly suitable for fabrications requiring great mechanical strength, high corrosion-resistance, low maintenance, and the material's natural appearance. As one of the most comprehensive manufacturing firms of its kind, Pendarvis Manufacturing brings value-added experience and resources to projects as small as a hand and as large as one can imagine. We are capable of building, bending, punching, welding, and configuring several alloys of stainless steel (including 304L, 316L, and 17-4 stainless steels) into a variety of shapes, such as channels, bar, sheet, angles, plate, and tubing. Transportation Industry: Various assemblies are used inside of railcars for collecting liquid waste are made using light gauge stainless steel sheet metal. Wastewater Industry: Due to its corrosion-resistant properties, stainless steel assemblies are used throughout the wastewater industry. 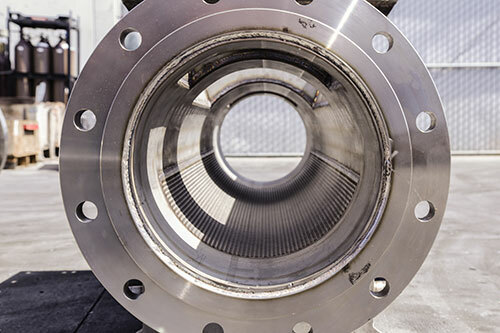 Clean Water Industry: Process piping components and stainless steel structures are used to hold the components assembled in plants that create clean water. With a reputation for quality work of the highest standards, our knowledgeable and efficient staff looks forward to helping you realize your designs. Contact us today.